Come learn some tricks of the trade from a professional home organizer! 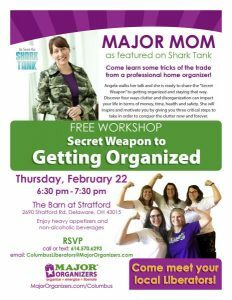 Angela (Major Mom) walks her talk and she is ready to share the “Secret Weapon” to getting organized and staying that way. Discover four ways clutter and disorganization can impact your life in terms of money, time, health and safety. She will inspire and motivate you by giving you three critical steps to take in order to conquer the clutter now and forever.